Less than two years ago, I was reading and writing about a new kind of passive circuit element—the memristor, a companion to the resistor, the capacitor and the inductor. (See the bit-player coverage, a bit-player followup and my American Scientist column.) The principal actors in this story were Leon Chua of Berkeley, who formulated the theory of the memristor 40 years ago, and R. Stanley Williams of Hewlett-Packard, who announced a working device in 2008. I haven’t been keeping up with memristor news lately, but I did notice that Williams has been making the rounds with a talk on “Mott Memristors, Spiking Neuristors and Turing Complete Computing.” When he came to Harvard last week, I went over to listen in. I discovered that my 20-month-old article is totally out of date. The memristor I wrote about in 2011 was based on ion drift in titanium dioxide. A layer of TiO2 was fabricated with a conductive doped region and an insulating undoped region. 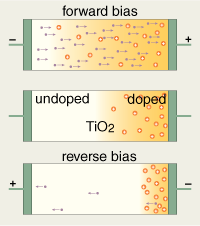 Current flowing through the TiO2 would shift the boundary between the two regions and thereby switch the memristor between conducting and insulating states. The device was bipolar: Currents in opposite directions had opposite effects. It was also nonvolatile: The resistance state would persist even after the current ceased. The memristor that Williams discussed last week is still recognizable as a member of the same family, but just barely so. Again the material is TiO2 or another transition-metal oxide, but there is no mention of doping. And, again, electric currents cause a change in resistance, but the underlying mechanism is quite different. Williams described the device as a cylinder of insulating oxide with a narrow conductive channel down the middle; current flowing through the channel heats the cylinder from the inside out, causing a phase transition that converts surrounding layers of material to the conducting state. Specifically, the heating induces a Mott transition, in which localized electron clouds begin to overlap, bringing on a sudden increase in conductivity. During the talk I didn’t hear Williams say anything about reversing the phase transition, but other sources indicate that the high-resistance state is restored by applying a second, larger current. Note that this memristor is not a bipolar device: The switching actions can be triggered by currents flowing in either direction. A heat-induced phase transition sounds like an unlikely mechanism for a modern computing element. When I heard the idea explained, I couldn’t help thinking of computing with a toaster, whose glowing red wires seem ruinously power-hungry, and awfully slow. But Williams says the Mott memristor can be both fast and efficient, because the active volume is very small, with a typical dimension of 30 nanometers. Even though the temperature swing may be as much as 800 Kelvin, the switching time is nanoseconds, and the energy dissipated is femtojoules. It’s a little disconcerting to see the basic physical principles of the memristor changing so drastically before the device even reaches the market. But I suppose there’s precedent in the early history of the transistor. The transistor announced by Bell Labs in 1948 was a bipolar, point-contact device made from a block of germanium; the world now runs on field-effect transistors imprinted on a silicon surface. Which brings us to the big, obvious question I wasn’t able to answer two years ago. Will the memristor become the transistor of the 21st century, transforming electronics and computing? Or will it fade away like so many other once-promising technologies, like magnetic bubbles or superconducting Josephson junctions? Or could it find a niche market, the way charge-coupled devices have? It’s well-known—and it may even be true—that most innovations fail to dislodge the incumbent technology. That’s a reason for betting against the memristor regardless of its particular merits and handicaps. No doubt it’s a smart bet. Nevertheless, I would like to say one thing in support of efforts to develop the memristor and other novelties like it. The mainstream in digital electronics is still focused on taking devices whose operation we understand at micrometer scale and trying to reproduce the same behavior in devices a thousand times smaller. It seems worthwhile trying the opposite strategy as well: Looking at what happens “naturally” at nanoscale, and trying to build something out of it. 5 Responses to Remember the memristor? In the meantime, it has become clear that HP Labs have not invented or found a device which works like a genuine memristor device. HP’s original memristor model which was presented in the “NATURE” paper “The missing memristor found” (Nature 453, 80-83 (2008)) suffers from fundamental physical flaws in its construction. The “memristor” claims are misleading when viewed from the perspective of electrochemistry: one cannot derive the characteristic dynamical state equations of a genuine memristor on base of their ion drift model. The critique can be found in the paper “Fundamental Issues and Problems in the Realization of Memristors” by P. Meuffels and R. Soni (http://arxiv.org/abs/1207.7319). 1)	Has anyone been able to come up with a realistic physical model that satisfies the state equations of a memristor/memristive system? 2)	Is it in principle possible to come up with realistic physical models that would satisfy the state equations characterizing non-volatile memristor/memristive systems? HP’s TiO2 based memristor device cannot work as proposed because HP’s physical memristor model is by itself invalid when viewed from the perspective of electrochemistry. The device will operate for a certain time like a “chemical capacitor” until the inhomogeneity in the doping profile (we talking about dopants with a finite mobility) is balanced out, thus violating an essential requirement on a memristor device, the so-called “no energy discharge property”. Furthermore, any disturbance of the equilibrium distribution of the mobile dopants will start to cancel out when the external stress is removed. So, it will be impossible to uphold persistent resistance changes in the course of time. The existence of memristor/memristive systems with the so-called non-volatility property seems to be impossible when one has a look at the given dynamic state equations under thermodynamic aspects. Following these equations, it would be possible to access a continuum of internal “equilibrium” states of a system – characterized by a state variable or a set of state variables – by merely applying some electric current or voltage stress on the system. 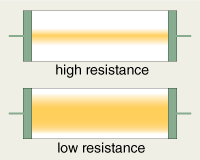 These internal states must be stable states because otherwise there would be no memristance: when the electric current/voltage stress is removed, these internal states would persist, i.e., the memristor/memristive system would retain the last resistance that it had when the external stress is switched off (non-volatility property). Equilibrium states of any material system are characterized by local free energy minima in the free energy landscape of the system; one will always “experience” some restoring or “frictional” force when trying to perturb such states, i.e., some finite amount of work is always required to bring about a transition from one equilibrium state to another. When a system is in an equilibrium state, weak perturbations, however, will only result in small departures from its original conditions and these will be restored upon removal of the cause of the perturbation (see, for example, “Fundamentals of Equilibrium and Steady-State Thermodynamics” by N. W. Tschoegl, Elsevier Science). That is the reason why equilibrium states of a system are largely “immune” to external interferences or internal fluctuations. As respects these arguments, the dynamic state equations of non-volatile memristor/memristive systems seem to be misleading. There are no terms which are related to some restoring thermodynamic forces: even applying the tiniest electric current/voltage stress on such material systems would suffice to change their internal states in the course of time – just by waiting – and these changes should be real physical/chemical modifications having an impact on the material’s resistance. Thus, the memristor/memristive systems approach suffers from a severe inconsistency. The “physics” behind the approach allows in principle a – so to speak – “frictionless” access to a continuum of internal equilibrium states of a system, but provides no explanation at all how these states are stabilized towards inevitable fluctuations. A point to make is that what might be called intermediate states are actually metastable. That is, they are local minima. Ion transport is a hopping transport across a complex energy surface. In principle, if the barriers are large enough, the intermediate states will be readable, by passing a very small current at a very small voltage, without upsetting the macroscopic state. In practice this is difficult. The HP memristors to not readily exhibit intermediate values and are envisioned to be used in binary operations. Other technologies, such as solid electrolyte memristors, do show intermediate states over a wide resitance range. The difficulty is in reproducing these intermediate states with sufficient precision. I should note that before the memristor, there was the memistor, a three terminal device, for which sensing and writing were two separate operations. This would be a preferred technology except that scaling would probably be problematic. As a former HP employee and stock holder, I feel that HP’s interest is and should be, delivering a device that has substantially better properties for use in a nonvolatile computer storage device than the others that are on the market. Flash memory is fundamentally flawed because of its limited write cycles. Flash memory’s durability of the stored information is fair, but not really permanent either. Does anyone know how HP’s proposed memristor devices would compare to flash memory in commercially important respects? Would it support substantially more write cycles? Would it dissipate less power in a typical computer application that does a lot more reads than writes? Would it be faster? When information is stored in a memristor device, would it persist and be readable for decades? How would the memristor and flash memory compare in areal density and ease of manufacturing? The burning question for me is not “will the memristor change the whole landscape of electronics”, but will it provide a much better computer storage device. steps up and steps down by a wireless electronic pulse.